Good morning stamping friends! This morning I stumbled across this awesome blog post from one of Stampin’ Up!’s Artisian design members… I just wanted to share Krista’s blog with you – didn’t she do an amazing job with all the decorations, games, and treats? 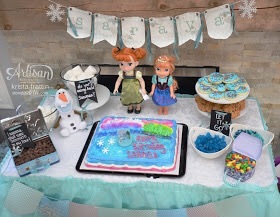 If you have a Disney themed birthday party or any party and need banners, decorations, and treats I’d be happy to help you out love to make a kids birthday a special day! This is the work of Krista Frattin, she is a Canadian Stampin’ Up! demonstrator and I admire her work and thought you would enjoy it to! I’m going to be doing some stamping later today at a diva day I got invited to so hopefully I’ll have some new things to share with you soon. Thank you all for your well wishes for my dad he is doing tremendously well at rehab and getting stronger every day he may even come home next week! Thanks for your positive thoughts and prayers! « Creative Inking Blog Hop- Birthday Bash!